【BOOKS】If You Die Tomorrow by Michael A. Lilly, Esq. If You Die Tomorrow is a layman s guide to estate planning with all you need to know about probate, death taxes, revocable living trusts, and transferring assets. 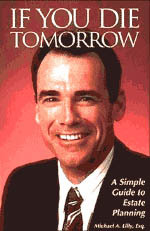 ■商品名称 【BOOKS】If You Die Tomorrow by Michael A. Lilly, Esq.